Originally created in 1937 by the German Labour Front, introduced as the “people’s car” for being more economically viable for people in comparison to the already saturated 1930’s luxury car market. The intention was that ordinary Germans would buy the car by means of a savings scheme. It soon became apparent that private industry could not turn out a car for only 990 Marks, and it was finally realised through a sponsoring of an all-new, state-owned factory using Ferdinand Porsche’s design. It has been a different symbol to different people across the years. From 1948, Volkswagen became an important element, symbolically and economically of West German regeneration. Afterwards in 1949 when it was first established in the United States the VW was briefly sold as the Victory Wagon. GSF Motor Works is one of the largest independent VW car servicing workshops in Central and South-West London. In our garage the Volkswagen car owner can have the service, repair and the maintenance of his car carried out cost effectively by our mechanics in line with the manufacturer specifications. GSF Motorworks has the latest diagnostic equipment and can carry out MOT testing as well as premium quality VW bodywork repairs. We are Volkswagen specialists and service centre. Hundreds of loyal customers trust us to service a Volkswagen, Seat or Skoda car similar to yours in our spacious workshop that spans across 9 servicing bays. Depending on the VW model, be it a VW Golf, VW Tiguan or even a VW Transporter, and your driving style we will apply either a Fixed Interval Service Schedule or a Flexible Service Schedule. The fixed interval service schedule applies to more recent models whereas for older VW models we may apply the traditional schedule intervals. A minor VW service includes oil change and filter change, comprehensive visual health check and report on any faults or defects, car wash and vacuum and a road test. In our car servicing workshop we can carry out your VW MOT test, Seat or Skoda MOT test as well as any VW Repairs including VW bodywork repairs, and VW gearbox rebuilds. With GSF Motor Works you maintain the Volkswagen Warranty as we strictly adhere to Volkswagen Service specifications, use dealer level VW diagnostics and apply VW approved parts and accessories. The Volkswagen Service Cost with us is a fraction of what main dealers charge. What we offer is not a cheap service as many independent garages do – we offer a trusted value for money alternative. 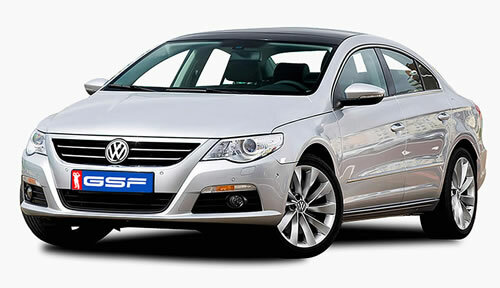 We can serve customers with VW in London SW, West and Central areas. Are you looking for a VW key replacement? Do you need to have your Volkswagen checked for wheel alignment? Do you want to have dents and scratches fixed or are you looking for some more serious VW accident repair? Or is it just about a simple service, and want to ensure that a proper Volkswagen diagnostic process will be applied? More of a “sporty” driving style using high rpms with heavy acceleration and heavy braking. The Time and Distance based service schedule includes a VW minor service every year or 10,000 miles whichever occurs first, a VW interim service every 2 years of 20,000 miles and a VW major service every 4 years or 40,000 miles. This Flexible regime has been made possible due to the development of new Volkswagen engines with the latest technically advanced long life Volkswagen oil. These engines use built-in sensors that continually monitor the VW oil quality, making it possible to enjoy reliable and confident motoring for up to a maximum of 18,000 miles or 24 months (whichever occurs first). Our workshop manager always inspects and checks any work done on your VW, Seat or Skoda, and one of our lead engineers finally conducts a thorough road test.